We recently had a chance to share On Beauty with the nation for the first time when Rock Center with Brian Williams profiled Rick Guidotti and his pioneering work with Positive Exposure. The response we received back was INCREDIBLE. This was followed up by a righteous piece on Upworthy that featured our trailer at its core. This is telling us that everyone wants to see a whole film about Rick Guidotti and Positive Exposure, and I am here now asking you to HELP MAKE THIS HAPPEN. In 2009 I was on the road promoting In the Family, and had a chance meeting with Rick Guidotti, a former fashion photographer on a mission to challenge the way we see people with genetic changes that impact their appearance. I knew then that I had to turn his work into a powerful documentary and engagement campaign. In my own life, I knew just how hard it was for me to come to terms with a hidden mutation, and I wondered how difficult it must have been for those who wore them on the outside. 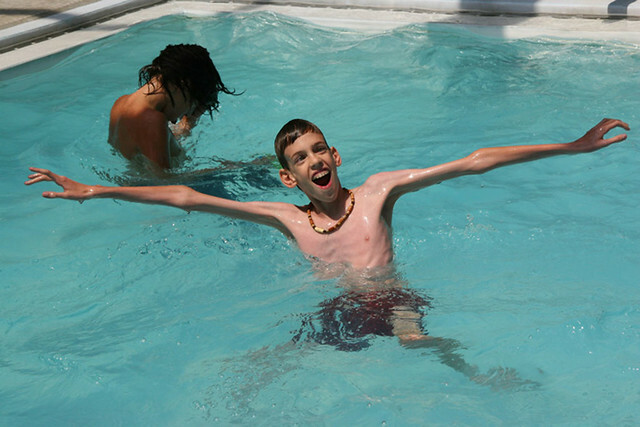 I specifically remember seeing the image below of a young boy in a swimming pool with arms outstretched, a huge smile reaching out of the photograph and thinking this looks like a happy young kid having the time of his life, not like disease; it was humanity framed right there, challening every notion we have about illness, limitation, and disability. I told myself then that I needed to meet the photographer. I wanted to tell his story. I embarked on a four-year journey following Rick from Kenya to Qatar to Upstate New York and everywhere in-between. Jayne Waithera, Nadia Merchant, and Sarah Kanney took over the story and won our hearts, and gave us permission to look, wonder, and ask questions. During this time, Rick has had exhibitions in more countries than we can list, appeared at medical schools, remade an outdated medical genetics film, launched an effective project-based learning anti-bullying program in schools, mounted an exhibition in Grand Central Station, and this summer is celebrating his 15th year anniversary with an exhibition at the Smithsonian Institute National Museum of Natural History. For those of you who got excited about the Rock Center piece or our trailer, WE WANT YOU TO SEE On Beauty, and we NEED YOUR HELP to finish the film. We completed principal photography and have a strong rough cut, but now we need the finishing funds to get to a fine cut, compose music, work on the motion graphics, color correct, and mix the film. You are our partners in this and NO AMOUNT IS TOO LITTLE. Please donate to get this story out there and pass it along to your friends. Help us #ShareBeauty. Joanna Rudnick and the On Beauty team at Kartemquin. Help complete Joanna Rudnick’s meditation on ideals of beauty.